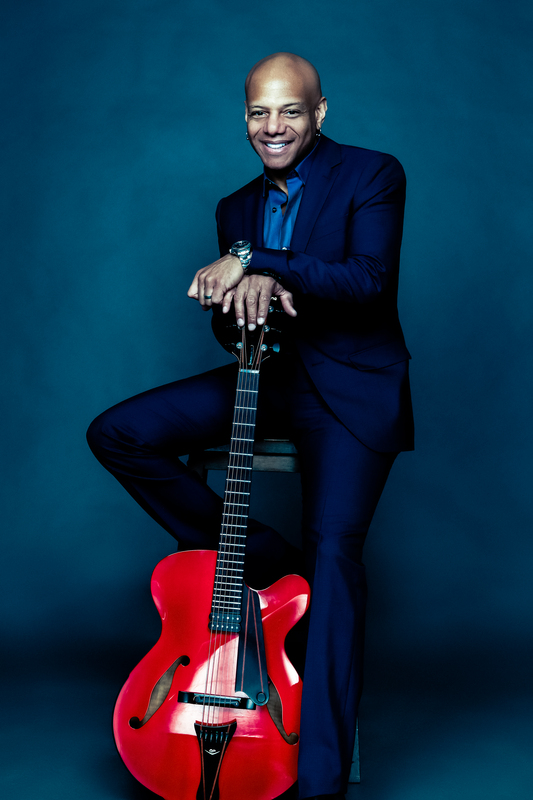 Since his first album as a leader in 1990, guitarist Mark Whitfield has been simultaneously pulled in two directions. Early on, many dubbed him the heir-apparent to George Benson, and on his first several records he offered plenty of evidence to support this assessment with his smooth, laid-back sound and the pop/R&B influences that he readily embraced. Yet at the same time, it was also abundantly clear that Whitfield possessed some terrific jazz chops, and the personnel on some of those early records, which included the likes of Kenny Barron, Jack DeJohnette, Ron Carter, Dave Holland and Al Foster, testified to his ability to play some fearsome, in-the-pocket jazz: proof that he could carry not just the legacy of Benson but Wes Montgomery as well. Most of Whitfield’s career has involved efforts to keep both of these tendencies in play, often on the same records, where mainstream jazz tracks sometimes alternated with pop-jazz or R&B-based cuts. As a result, figuring out which Mark Whitfield one would hear on a record was always a bit of a mystery.Although this record is distinctive in that it’s a true family affair, with Whitfield’s sons Mark Jr. (on drums) and Davis (on piano) joining him in a quartet that includes bassist Yasushi Nakamura, the same stylistic bipolarity remains. On the one hand, much of the material is impressively-played jazz or jazz-fusion. For an example of the latter, witness the shape-shifting first track, “Afro Samurai,” where Mark Jr. skillfully steers the group through a few different meters and gives the song its propulsive momentum. Other tracks offer hard-charging straight-ahead jazz, like the superb “Double Trouble” and “The Socrates Curse,” which give Whitfield a chance to stretch out and demonstrate his patented “quick pick” technique for which he’s justly admired. Pianist Davis Whitfield provides a sure hand throughout the record, whether on piano or keyboards, and it’s clear that all three Whitfields have a strong rapport, one undoubtedly honed over years of in-house musicianship. “Blue D.A.” is another fine example of the group’s synergy, and it’s an excellent blues-based track that swings fiercely, allowing plenty of room for solos that are stimulating and engaging. But this release, like many of Whitfield’s prior ones, does also exhibit his inclination to draw liberally from the R&B/pop-jazz spectrum. Tracks like “Grace” (featuring the vocals of Sy Smith) or “Undiscovered” are a bit too saccharine, and they veer too far from jazz territory to maintain the cohesiveness of the record. These tracks are played well enough, to be sure, but it seems doubtful that this material will fully satisfy Whitfield’s mainstream jazz listeners, just as it’s likely that the more challenging cuts like “The Socrates Curse” won’t be as appreciated by fans preferring the band’s lighter fare. So while the record reveals once again Whitfield’s formidable skill and his ability to do pretty much anything he wants on the guitar, a more integrated stylistic palette would have made the release even stronger and more compelling.